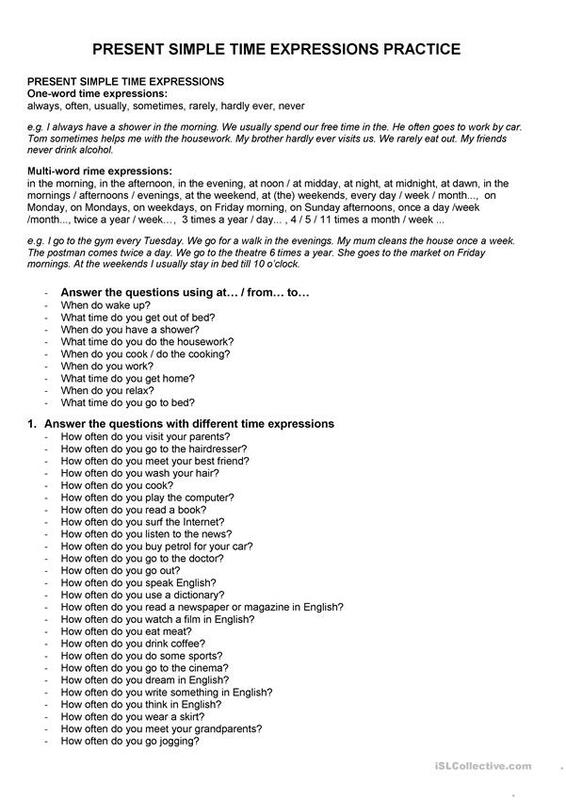 This is a grammar worksheet to practise the different time expressions that are typical in the Present Simple tense. In the first part of the sheet the 2 groups of time expressions are listed and in the second part 2 groups of questions help to use the time expressions in sentences. This downloadable teaching material is meant for elementary school students at Beginner (pre-A1) and Elementary (A1) level. It is aimed at consolidating Present simple tense in English, and is a valuable material for enhancing your class' Speaking skills. It is focused on the theme of Time. kincsen is from/lives in Hungary and has been a member of iSLCollective since 2015-02-12 21:37:56. kincsen last logged in on 2019-04-14 17:10:37, and has shared 3 resources on iSLCollective so far.